The high-paced, aerobics-turned-dance sessions are not limited to skilled dancers (Roman Krivitsky/TTN). Why go to Funkytown when the IBC is right on campus? Cardiovascular workouts can make it difficult for participants to remain motivated as they exercise. The IBC Student Recreation Center offers a new cardio session that not only helps to burn calories but also improve dance moves. Hip-Hop Funk is a workout offered on Tuesdays, Wednesdays and Thursdays during the evenings to accommodate student participants’ busy school and work schedules. “It is a lot of fun, even if I don’t get the routine right away,” said Aileen Rimando, a senior violin performance and music education major. Rimando is a frequent dancer at Tuesday night sessions. 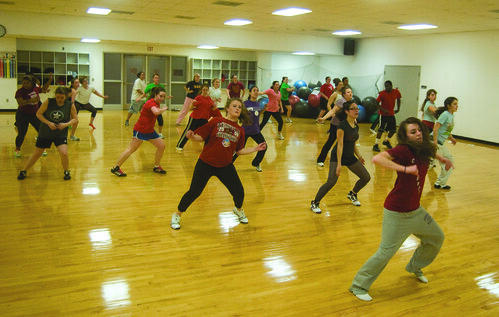 Tuesday night sessions of Hip-Hop Funk are taught by Alyssa Spangler, a junior kinesiology major. Spangler is also a member of Temple’s Diamond Gems dance team. Each time, the class begins with a warm up, which isn’t difficult even for the rhythmically challenged. If the warm up is hard to understand at first, it can easily be learned with practice. Each part of dances are taught and performed in counts of eight. After repeating the warm up several times in order to increase participants’ heart rates, dancers then move into a series of stretching moves. Spangler said she wants to ensure every muscle is loose and each dancer is able to move without any tension in his or her body. After simple stretching moves, it’s time to learn the dance routine. Spangler goes over all the movements a few times to help make memorization of the routine easier. Although some of the routines can be long for those who don’t dance often, she always repeats the moves. She also gives personal attention to anyone who is having difficulty with the moves. Spangler offers about 10 minutes of abdominal workout at the end of class for anyone who is interested, but it is not a mandatory part of the session. “The Wednesday night sessions are such an intense cardio that I can barely breathe after that session,” said Rachel Halkias, a junior journalism major. Halkais attends both the Tuesday and Wednesday night sessions with two different leaders. She does this to get the best out of the IBC Hip-Hop Funk experience. Tuesday and Thursday night sessions have a more choreographed dance, and the routine is repeated a few times. Wednesday night sessions are typically made up of shorter dances, but the routines are repeated often to ensure a maximum cardio workout. Don’t be discouraged from attending Tuesday and Thursday sessions because not everyone in the class is a skilled dancer. You won’t be the only one who will have to practice a few times before grasping it completely. “Even if I don’t get the routine, it’s a great way for me to blow off steam,” said sophomore music education major Catherine Fish. Stephanie Mullen can be reached at stephanie.mullen@temple.edu.